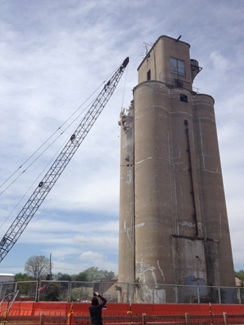 Casey-Bertram (C-B) was contracted by the Carmel Redevelopment Commission to raze the 140’ feet tall grain elevator along the Monon Trail in Carmel, Indiana. C-B had to protect existing utilities from getting damaged in the process of bringing down the massive 100 year old concrete structure. There were live fiber optic lines, as well as other utilities within 10 feet of the structure. Casey-Bertram used a conventional crane to bring down the top 100 feet, then using an excavator with a hydraulic hammer and a concrete pulverizer to process the concrete to load and haul off site. Interested in additional industrial or commercial demolition projects? Check out our demolition project gallery.